to the #1 recommended treatment for chronic insomnia. 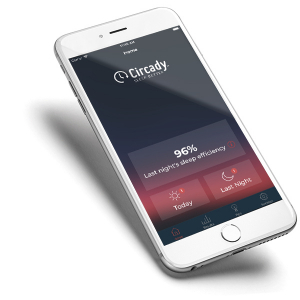 Circady – Sleep therapy at your fingertips. Do you have trouble falling asleep, staying asleep, or getting good quality sleep? You may have insomnia. Circady is here to help. Take the Circady Sleep Assessment to see if Circady is right for you. Get your sleep report and connect with a certified Circady sleep specialist in your state. Download the Circady app, a mobile sleep diary used to improve the accuracy and effectiveness of treatment provided by your therapist. Begin treatment in-person or virtually through Circady’s convenient telehealth platform. Sleep therapy: A drug-free approach to getting better sleep. If you’re suffering from insomnia, you should know about sleep therapy. Sleep therapy is a drug-free form of treatment that involves addressing behaviors which negatively impact your sleep. Sleep therapy is recommended as the first-line treatment for adults with insomnia, in accordance with a clinical practice guideline issued by the American College of Physicians. Circady sleep specialists all are experienced sleep therapy providers ready to help you beat insomnia and get a better quality of life. A revolutionary sleep diary, right in your pocket. The Circady app is an easy-to-use, mobile sleep diary for Circady patients to use during the course of their treatment. Circady sleep therapists share access to their patients’ sleep diary data, giving them a more accurate representation of their sleep habits. In turn, treatment is more efficient, accurate, and effective. Think Circady may be able to help you beat insomnia? Get started by taking our quick and easy assessment. Or contact us to get more information.